During the Second World War, nicknames were very popular, not only for individuals but also for the different forces taking part in the struggle. New Zealand's armed forces were differentiated from other forces such as Yanks, Poms and Boks etc by the name of New Zealand's famous flightless bird - the kiwi. 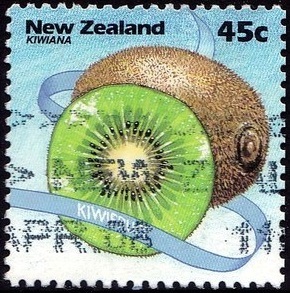 The nickname stuck and the friendly appellation, "Kiwi", is still used all over the world when referring to people from New Zealand. From that nickname has come another word - Kiwiana - to describe those, sometimes, almost intangible things that contribute to the character and culture of New Zealand. 1994 Kiwiana I Booklet - Mint Example. Food and attire immediately spring to mind when thinking about our most memorable pieces of Kiwiana. 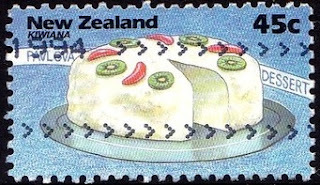 With the exception of the much-loved and admired Buzzy Bee, every stamp in this, light-hearted Kiwiana stamp issue featured New Zealand 'cuisine' or clothing. From fish and chips to pavlova, from a bush shirt to jandals, every item is a genuine part of our culture. 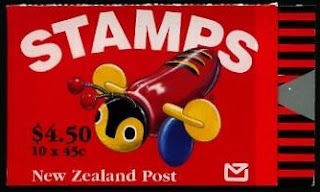 A se-tenant block of 10 x 45c stamps was issued as a stamp booklet featuring pavlova, pāua shell, hokey pokey ice cream, fish and chips, jandals, rugby boots and a rugby ball, bush shirt, black singlet and gumboots, Buzzy Bee and kiwifruit. 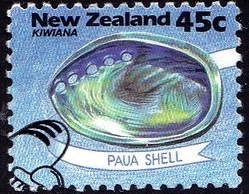 45c - Paua Shell (used). Pāua is the common Māori name for Haliotis iris, a New Zealand species of abalone, an important food source and also prized for its beautiful shell. The brilliant peacock blues and greens of the shell interior surfaces made it a household item in New Zealand. It would be a safe guess that at some time all 'Kiwis would have owned at least one item made from Pāua shell. Jewellery - brooches and pendants, sets of cufflinks - were fashionable and popular. The shell had other decorative uses as well, for instance, many gardeners would use them as an edging to their flower pots. And they were functional too as ashtrays in most homes and workplaces. New Zealand's national dessert! A meringue base topped with copious quantities of whipped cream and fruit. The strong colours of the peaches, strawberries or kiwifruit contrasted with the snowy white cream. The whole confection has won deserved and lasting praise, though its calorie count may work against it with those watching their weight. Named for Anna Pavlova, the Russian ballerina who visited this country in the 1920s and inspired an imaginative chef to dream up this culinary interpretation of the dancer's tutu. There is some doubt as to the nationality of the chef but 'Kiwis' regard the pavlova as their own. 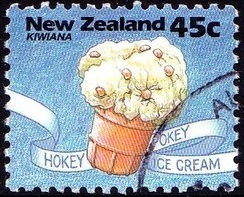 45c - Hokey Pokey Ice Cream (used). New Zealand is, of course, a country with a dairy farm history. Dairying has been a large contributor to the national wealth and those in the industry have earned the respect of the world for the standard and variety of their products and produce. Hardly surprising, therefore, that 'Kiwis' have been amongst the largest ice cream consumers, per capita, in the world and Hokey-pokey has been at the top of the flavour lists since its introduction 50 years ago. A crunchy honey-comb toffee added to vanilla ice cream. Simple! Delicious and nothing quite like it is found elsewhere, distinctively New Zealand. 45c - Fish and Chips (used). No claim is made to this fare having been invented by New Zealand. It is widely regarded as purely English in origin but New Zealanders have embraced the dish with a fervour matching that of any English devotee. 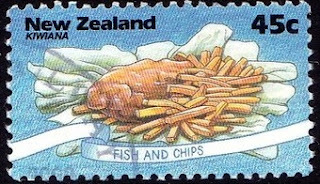 The tradition of taking fish and chips from a vat of hot fat, depositing them all on a large piece of paper, sprinkling salt over the serving and finally wrapping it again in an outer layer of newsprint has kept this, by far, the 'Kiwis' most popular takeaway food. The mouth-watering aroma from the local fish and chip shop has often been enough to entice an unpremeditated purchase. The word Jandal is derived from 'Japanese sandal' and came into the New Zealanders' vocabulary in the 1950s when these simple rubber sandals were first produced here. 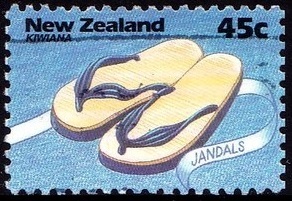 Similar products are known in other countries by other names - thongs, flip-flops, etc but in New Zealand, it is Jandals that has become part of the New Zealand language. As an item of high fashion, the simple foot-shaped sole and V-shaped toe-strap may not rate highly but they are considered by "Kiwis" as just the job for summer casual wear. 45c - Bush Shirt (used). The bush shirt has been around for about 60 years. Warm and shower-proof, this pure wool garment was found ideal for the outdoors - farmers, bush workers, trampers and anglers were the first to 'discover' it but they were soon followed by the general population. 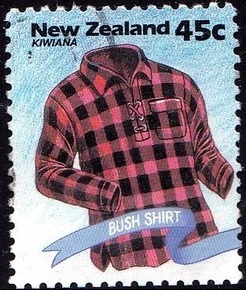 It has been produced in bright coloured checks for, among other considerations, ease of visibility in the bush. So the bush shirt is safe, practical, sensible and comfortable. No wonder it is part of Kiwiana. 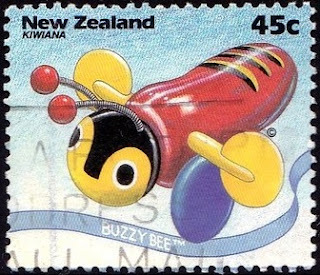 45c - Buzzy Bee (used). Two Auckland brothers, Hector and John Ramsey, created this pull-along toy in the 1940s. That it would be such an incredible success was probably not in their minds at the time, but history has proven its worth as a design of enduring popularity. Buzzy's spinning wings, wobbly antennae, bold bright colours and a very satisfying clackety-clack sound were the ingredients that immediately won the hearts of children. Hundreds of thousands of these wooden toys have been produced since and it is quite possible to find an old, battered but well-loved one in many an adult's box of personal childhood memories. 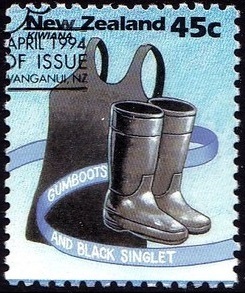 45c - Black Singlet and Gumboots (used). The black singlet has become another essential item in the outdoors worker's wardrobe. It is warm, does not show dirt too quickly, and in warm weather particularly, it soaks up the sweat usually associated with hard, manual work. It is sleeveless for less constriction, freer movement and for these reasons has gained and maintained its place in Kiwiana. The gumboot is worn by all ages from puddle-stamping school children to retired suburban gardeners wanting to keep their feet dry. Out on the farm, gumboots are as common as the black singlet, perhaps even more so. Gumboot throwing is a novelty sport that has been fostered in the town of Taihape - the 'Gumboot Capital' of New Zealand. 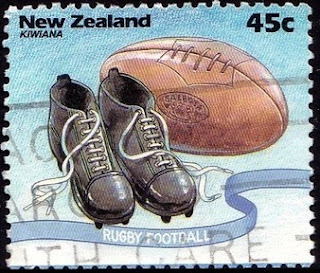 45c - Rugby Boots and Rugby Football (use). Boys, girls, young men and young women play rugby. Those who are too old to play are usually avid spectators. Most New Zealanders are self-confessed experts of the game. This is never more apparent than when the All Blacks play. The team, the management, the selectors, all receive advice from all quarters. Rugby, New Zealand's national game, is taken extremely seriously with many followers being able to quote historic scores, describe past games in detail and expound strong opinions about the players of today versus those of yesterday. It is only a game - but a very important one! The Chinese gooseberry was found to grow in profusion in New Zealand. Horticulturalists developed improved fruit strains and renamed it the Kiwifruit. In the 1970s and 1980s, this fuzzy, brown-skinned, bright green fruit with wonderful vitamins and other health-giving properties was heavily promoted and marketed overseas. New Zealand growers made their fortunes with this 'new, exotic' fruit until growers in other countries began producing and flooding what had been New Zealand-only markets causing a collapse in demand. Even so, millions annually were still sold abroad, such is the popularity of the fruit. The Booklet (a used example) and it's cover. I like the way they used the Buzzy Bee on the booklet cover. I think that is by far the best icon of this set. First Day Cover - 27 April 1994. Again the feature of this First Day Cover is the Buzzy Bee. These stamps remained on sale until 27 April 1995.